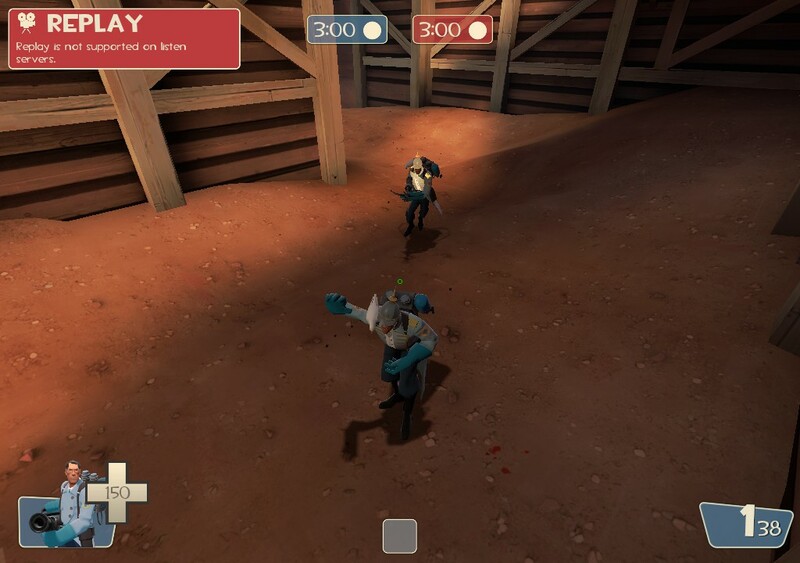 The first time I equipped the High Five! I wasn’t doing it for a tactical benefit. I’m just a friendly guy who likes being able to interact with his teammates, and I enjoy offering a congratulatory High Five to my crit-boosted enemies during humiliation to distinguish the honorable opponents from the vengeance-thirsty hordes. But after a significant amount of time using it I quickly realized that the taunt had some very nice perks in the game proper. Here are three reasons you should consider stashing that rage-inducing Schadenfreude for some situational bonuses. 1) It’s basically a toggleable third-person view. When the button is pressed, your character gains clairvoyant powers and can see in all directions until you let go of the button. The uses are limited only by your imagination. Tap the action key to glance around a corner without exposing yourself. Set sticky traps and watch them from places it would otherwise be impossible to watch. Don’t want to run up the stairs on 2fort to check your sentry? Stand vaguely near the bottom of the stairs and taunt for a second! No more. Stand directly on the teleporter and hold down the action key. You become immobile, and there’s nothing your ungrateful teammates can do about it. Plus if one of them can time it right, you might thank the engineer on the other side by slapping him in the face. He has no idea I’m looking right at him. 3) Bait that one spy. This is an extremely situational use of the High Five! but I’ve never seen a spy that saw it coming. 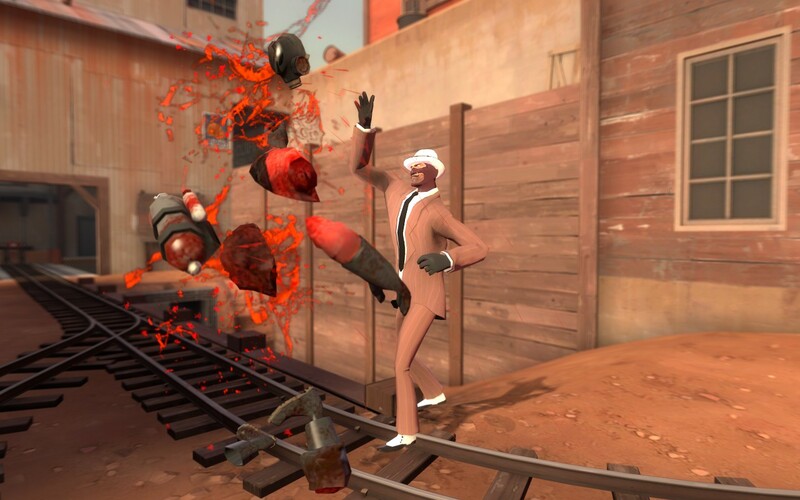 If you’re in a position where you know that there is a hidden spy nearby and nobody is going to interrupt you, initiate a High Five, then turn the camera 180 degrees so it’s staring right behind you. Your character continues blithely staring forward, but you see the spy decloaking behind you, expecting an easy kill. Too bad you can stop High Fiving in a split second, whereupon your character will pirouette 180 degrees ready to do unspeakable things to your exposed adversary. You can almost guarantee they’ll be saying something in the chat about it afterwards. Do note though, that if the spy has any thought processes whatsoever, this will only work once. 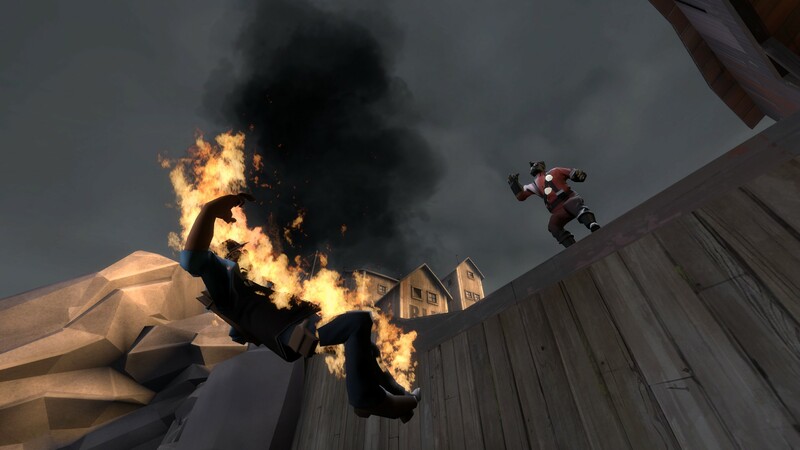 The absolute apex of Team Fortress 2 comedy. Picture by FeelGoodInc.